Despite the fast growth and increasing popularity, the broad field of RDF and Graph database systems lacks an independent authority for developing benchmarks, and for neutrally assessing benchmark results through industry-strength auditing which would allow to quantify and compare the performance of existing and emerging systems. Inspired by the impact of the Transaction Processing Performance Council (TPC) Benchmarks on relational databases, the LDBC consortium formed by University and Industry researchers and practitioners has recently launched a European Commision sponsored project that will offer the first comprehensive set of open and vendor-independent benchmarks for RDF and Graph technologies. The consortium will incorporate the Linked Data Benchmark Council (LDBC) which will survive the project and will supervise the process of obtaining and reporting results as well as fostering the creation and maintenance of new and existing benchmarks. This paper describes the state-of-the-art benchmarks in RDF and Graph databases and overviews the technical challenges that should be addressed in the development of such benchmarks. With this paper we would like to invite the readers to participate in the LDBC effort towards the development of Linked Data Benchmarks, both from the user prospective (by sharing available usage scenarios, datasets, query workloads) and the vendor perspective (by reporting the results of systems and research prototypes). Boncz, P.A, Fundulaki, I, Gubichev, A, Larriba-Pey, J, & Neumann, T. (2013). 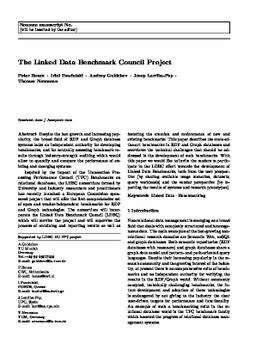 The Linked Data Benchmark Council Project. Datenbank Spektrum, 13(2), 121–129.